Lists are one of the least known types of styles in LibreOffice Writer. 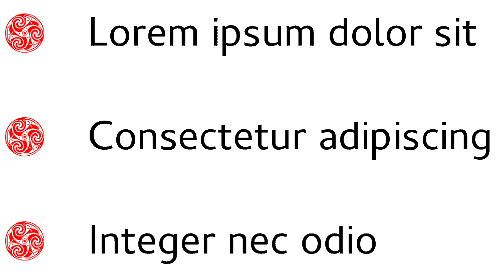 If people use list styles at all, they attach them to paragraph styles to create automatic bullet or numbered lists. However, list styles have far more versatility than such uses imply, including the method shown here for creating a To-Do list for online or hard copy use. 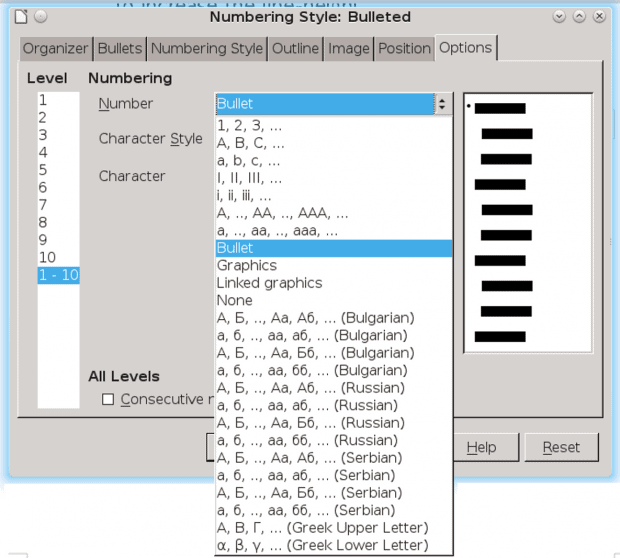 This trick depends on the fact that list styles can use any character as a bullet. Dingbats — sets of pictures available as font files — can be especially effective, giving you anything from a dinosaur or a pirate to a piece of Celtic knotwork as a bullet. You could even use a photo, although the best dingbats usually have a simple design and few colors. 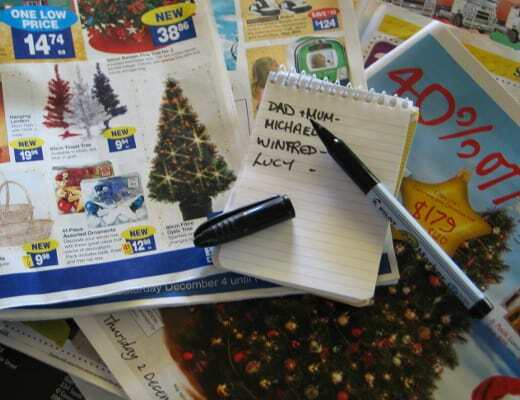 You can use fancy bullets to spice up your lists. However, to make a To-Do list, you don’t need to be so adventuresome. Instead, you will need one matching trio of a character, paragraph and list style to create a list to print, and two trios of styles to create a list to use online. Give all the matching styles the same name so that you know that they are meant to work together. Start with a character style called Open Box. Press F11 to open the Styles and Formatting window, and, after clicking Character styles, right-click anywhere in the pane to create a new style. 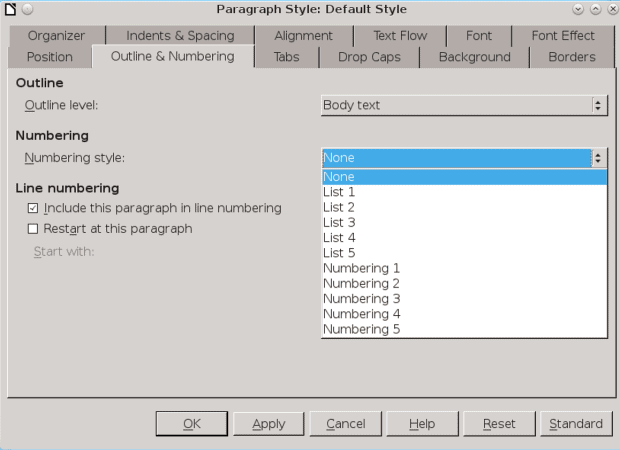 Use the character style to set the size, color, and other formatting. Switch to List styles, creating a list style called Open Box (since the list style’s name will never appear alongside the character style’s, you are in no danger of confusing the two). Click Options > Numbering > Bullet, then set the Character Style field to Open Box. Clicking the Character field opens the Special Character dialogue window, from which you can pick U+E00B — an open box — as the bullet. Set up the bullet list on the Options tab for a List style. Create the Open Box paragraph style. On the Outline and Numbering tab, click the drop-down box for the Outline level field to select Open Box. You may also want to adjust the spacing above and below each paragraph on the Indents and Spacing tab, so that each item has plenty of room. Attaching a List style to a Paragraph style is the most efficient way to apply it. You can now create a To Do list, using the Open Box paragraph style for each list item. Print the list you have made, checking off the box beside each item as you complete each task with a pen. To use the list online, you need to create another trio of styles. Call each of these styles Check Mark, and use the character U+E531, a box with a check mark, for the bullet. If you want, you can also create a third style using the character U+E532, a box with an X mark) to indicate tasks that are incomplete. As you use the list, change the paragraph style to show the stage that each item is at. After you have made your first To Do list, save it with File > Save As Template, so that, the next time you want a To Do list, you don’t have to design it from scratch. Just be careful not to remove an item without replacing it with new text — if you forget, the paragraph will disappear, because each list item requires at least one character. A To Do list with dummy text. Change the paragraph style, and you change the check box beside each item.